The Republic of Botswana became independent on 30th September 1966, and is a multi-party democracy. Botswana has an Executive President which is president for five years, the current president is His Excellency Lt. Gen. Seretse Khama Ian Khama. Botswana is landlocked and has a surface area of 581,760 square kilometers, its bordering neighbours are South Africa, Namibia, Zambia and Zimbabwe, most of Botswana is covered by The Kalahari Desert and most of the population is located in the east and southeast of Botswana. The capital city of Botswana is Gaborone which is located in the southeast of Botswana, Gaborone has good communication with South Africa via road and air, Botswana's other main towns are Francistown, Lobatse, Selebi-Phikwe, Ghanzi, Mahalapye, Maun and Kasane. Botswana is one of the most beautiful wildlife regions in Africa, with vast tracts of empty wilderness set aside as game reserves. These reserves are home to hundreds of wildlife species, including Africa's Big Five (lion, leopard, elephant, water buffalo, and rhino), as well as many other large game such as cheetah, hippo, crocodile, giraffe and many smaller antelope. The Okavango Delta is the largest inland delta in the world, providing a vast refuge for the abundant wildlife of the region. The Okavango River flowing in from the north provides the primary water source of the delta, also known as the Okavango Swamps. The Moremi Wildlife Reserve covers nearly 5,000 sq. km. of the eastern section of the Okavango Delta. This beautiful region is well supplied with many bush camps and bush lodges providing excellent access to the woodlands and flood plains of the region. Most camps and lodges in Moremi can arrange to pick up travellers at the airport in Maun, located about 100 km to the south of the reserve. To the east of the Okavango Delta lies the Chobe National Park, which is also primarily an inland delta, fed by the Chobe River, that flows in from Zimbabwe. The Chobe provides sancuary for the largest elephant population in the world. The Kalahari Desert covers most of the southern regions Botswana. As it's name implies this region of Botswana is very dry and sparsely populated. Much of this region has been set aside in two game reserves, the Central Kalahari Game Reserve and the Kgalagadi Transfrontier Park. Accommodation and transport in these regions are equally sparse. Summer (Nov to March) is generally very hot in Botswana, with the occasional thundershower offering some relief. Visitors to Botswana are therefore well-advised to plan their vacation here during the Winter months from April to October, when the days are warm and sunny. Winters offer better game viewing because the bush is less filled in, and large game can more easily be found gathering near watering holes, that become increasingly scarce towards the end of the dry season. There are two ways to travel to Botswana, by road and by air. Air Botswana (Botswana's airline) has daily flights which include international flights from Gaborone to Johannesburgh and Harare as well as internal flights to Francistown, Maun and Kasane. South African Express also provides daily international flights, and Air Namibia has flights five times a week from Windhoek to Maun. The official language spoken in Botswana is English, and the common business hours in Botswana are Monday to Friday, 8am to 5pm. The currency of Botswana is the Pula, notes are P100, P50, P20 and P10 and coins are P5, P2, P1 and thebe 50t, 25t, 10t and 5t. There are seven main banks in Botswana and a number of foreign exchange bureaux. 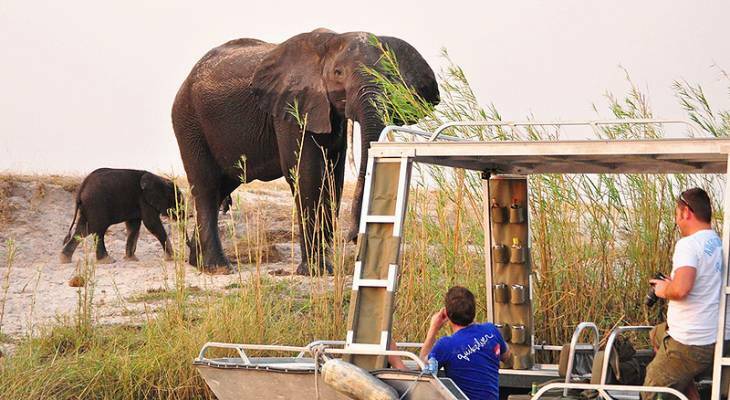 Game safaris are by far the most popular tourist attraction in Botswana. The major national parks of Botswana are offer plenty of related activities including fishing, canoeing, and boat cruises. Palapye Hotel is one of the oldest hotels in Botswana, and is situated at Palapye Railway Station. Botswana Accommodation and Information. Botswana, Botswana.